Do you ever feel like if you’re having a bad hair day it can really make your whole day seem terrible? Bad hair days can be common when you live in the heat and humidity of North Carolina (especially in the summer!). And when I’m traveling to the race track, you never know what the weather is going to be like or how my hair is going to turn out. Trust me, rain delays not only affect Kyle and the race – my hair too! BUT, I can truly say, there’s nothing like having a GOOD hair day! When my hair is looking and feeling great, I have more confidence and I’m ready to take on the day. And as I’m sure you all know, the key to having a great hair day always starts with using a good, reliable shampoo and conditioner! Honestly, the shampoo and conditioner you use can make or break (literally!) your hair. I was always told that I shouldn’t wash my hair daily, and even though I workout every day, I was a dry shampoo addict. Well, with Pantene’s new shampoos, I’m not afraid of washing my hair more often after workouts (when I actually have time!). The shampoo doesn’t strip my hair of moisture and nutrients like other brands would and it feels so much healthier after using it a handful of times. My hair really is more smooth and shiny now and my good hair days are happening way more often than before. I knew I liked this shampoo as soon as I felt it in my hair. The shampoo has a really creamy, luxurious texture to it, which I love! It suds up really easy so a little goes a long way! When I’m washing my hair, I can feel it working because my hair is so smooth and easy to detangle right there in the shower before even using the conditioner. Even better, this product will help strengthen and protect against further damage by working with your hair from the inside out and adding nutrients back into your hair. I’m a girl who loves to style her hair (especially at the race track!) and my hair was actually more manageable and easier to style after washing with Pantene. For someone who is always in a hurry and on the go, this is a major plus for me! 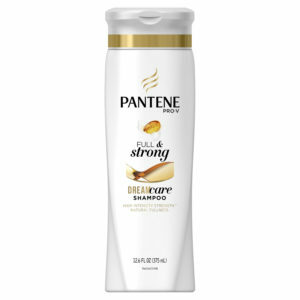 If you have dry, damaged hair and are looking for something new, I highly recommend trying the Pantene Pro-V Full & Strong Shampoo and Conditioner. Let me know if you are a Pantene fan and what products you use! Thank you to Pantene for sponsoring this post. All opinions are my own.